With new printing proofs in hand (check out the update on Kickstarter) we figured it was time to spoil the mechanics behind the new heroes coming out this year. So without further ado, let’s take a look at Zariah the Summoner and her three companions Scrappy, Bandit and Amber! Zariah the Summoner is a generalist, capable of doing many things well without the laser focus of other characters. She usually won’t be swinging for Cormac-size damage or stealing all of your gold like Gerki does. Instead, she’ll play it safe, making plays that suit the situation at hand. The wrinkle, however (and it’s a BIG wrinkle) is that many of her cards summon her friends Scrappy the Lion, Bandit the Ferret and Amber the Alemental. After a card with one of the above symbols resolves, Zariah gets to summon the corresponding buddy to the table. Now, Scrappy, Bandit and Amber aren’t too impressive on their own, but when you get all three of them to the table, they team up and form the mighty Chimera! The Chimera opens up a whole world of options for Zariah. Off the bat, Chimera can be spent as an Action card that causes 3 Fortitude Loss, but that’s the least of its potential. Many of Zariah’s cards have a “Chimera:” effect. “Chimera:” effects can only be played if you spend your Chimera. Each effect is either an incredibly powerful buff (like dealing 4 Fortitude Loss) or something completely unique (like making a player drink the worst of two drinks!). 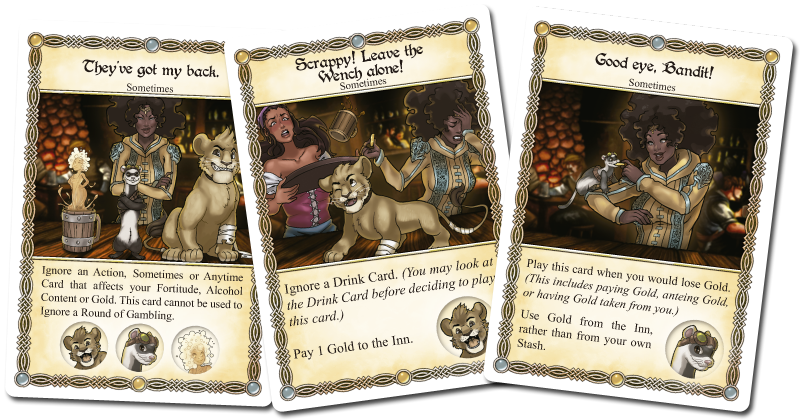 The Chimera and its power-ups on Zariah’s cards give her the edge to focus her Action cards or avoid the worst the party can dish out. Summoning the Chimera quickly and frequently will be the key to victory as Zariah. You will find yourself focusing on sculpting your hand, hunting for the cards that summon the last piece of the puzzle, while hoarding the best “Chimera:” effects! Zariah is due out this fall along with Wrench, Halden and The Red Dragon Inn: 5. Get a jump on your friends and check out her complete rules here (PDF, 1 MB). « Season 3 SlugCrew Rewards!